Our 100% Cotton Yoga Diamond Pattern Rugs are an eco-conscious yoga mat because they are made of a natural material, biodegradable and PVC-free. 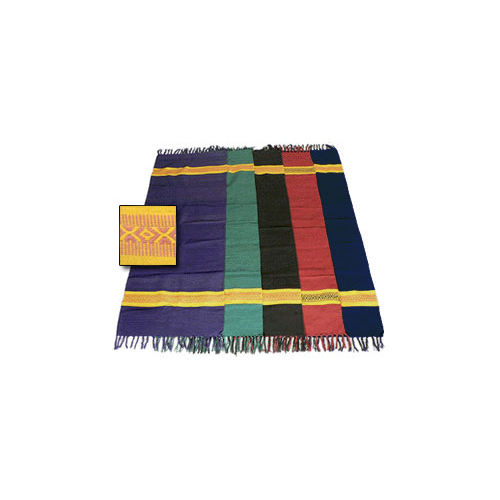 Cotton yoga rugs have been used for centuries for Hatha Yoga and are considered to be the first mats ever used for Yoga practice in Mysore, India. These yoga mat rugs are excellent for hot yoga because the tightly woven, thick weave cotton fibers soak that up moisture and help you maintain your poses without slipping. When laying your cotton rug on a wood floor, we recommend lightly misting the entire rug surface to reduce slipping. This classic cotton diamond pattern rug can also be used on top of your favorite yoga mat for extra padding. Wash your yoga rug in cold water and hang it to dry. Please do NOT put it in the dryer, as the heat of the dryer will cause the rug to shrink. Your rug may tighten up after air-drying but it won't shrink. Your cotton yoga diamond pattern rug will maintain its beauty and soften with repeated use. I bought this rug as a replacement for an identical one I purchased 30 years ago and was delighted to find it was exactly the same style and colour. It was lovely to see the vivid blue and yellow of the original again. It is however, slightly lighter in weight and consequently not quite as thick and hard wearing as the original. I suspect the cotton used for the weave has been upgraded over the years to a new thread type, which is slightly finer and maybe less dense. So while it does seem to be the same rug as I got 30 years ago, please don't expect it to last as long as that. Maybe only 20 years now. To be honest I should have replaced my rug many years ago but it was not until it started coming apart that I felt the need to buy a new one. This replacement should last me for many years provided I follow the washing instructions correctly (oops).